I bought this because I thought it would be interesting to see what a wartime foraging book would include, particularly a wartime foraging book written by a French aristocrat. It is. I can however, start by saying that I won’t be trying every recipe. I’ve already tried pike, rook and frog’s legs over the years and I’m not that bothered about trying them again. That’s the 2016 me talking, of course, if it was 1940 again they’d soon be back on the menu. I’m certainly not intending to try roast sparrow, wild birds’ eggs or roach. Apart from the legal aspects, which have changed over the years, sparrows are now quite rare and I’ve recently seen roach described as “cotton wool stuffed with pins”. (by W.M.W. Fowler in Countryman’s Cooking). The rest of the book is more to my taste, though some of them are a bit elegant – trust a Frenchman to bring foraging up to a different level! Sorrel Bourgeoise, cardoons mornay and truffles all make an appearance. There are also good sections on substitutes (home made baking powder, pepper from nasturtiums and bacon made from mutton) and Wines, Beers and Syrups. I’m not quite so sure about the section on medicines, because I’m so used to seeing disclaimers these days, and because I’m not keen on any herb called “weasel-snout” (there are two I can find but the one listed appears to be Lamium Gaieobdolon – yellow archangel or dummy nettle). Finally, after an informative chapter on making charcoal, preserving eggs and trussing poultry we end up with health and beauty tips, including how to rid yourself of freckles with horseradish. It’s a great read, with much to offer the modern forager, though I’m not sure I’d trust it as a guide to what people actually ate in the war. I know the Victorians ate small birds, and I know the French still do but my mother never spoke of it, she merely told me never to buy a rabbit unless it had the skin on. It seems that’s the only way to ensure you aren’t being sold a cat. So, in summary, an excellent book which has stood the test of time and spans a variety of subjects with a range of food from basic to fine dining. When I reviewed Meadowland (see below) I said that there were a few small points that I thought could have been improved on – choice of “year”, dense prose and a lack of set-backs in nature watching. For that reason I gave it a slightly harsh 4. I also used over a hundred words to say what I’ve just summed up in one sentence there – must do better! The Wild Life starts with the shooting season, uses more natural language and details plenty of knock-backs. It features one man working with, and against, nature plus a few other stories and is, to my mind, a more satisfactory book. It may not be an award-winner but it’s a better read and a more human story. The premise is that the author can live off nothing but wild food foraged from his forty acre holding. That he was mad enough to try this is, in my opinion, proof that he should have had his guns taken off him at that point, but then there wouldn’t have been much of a menu. I forage, but I struggle to find enough to make a couple of meals a week. Admittedly, I don’t have all day to forage, which he does, but I seriously doubt my ability to exist off what I could pick. I could probably find the calories, but I’d struggle to find the enthusiasm for salad every day. The problem with foraged food is that it is mainly small, green and leafy and man cannot live off salad alone. The meat part is more substantial but is generally wrapped in fur or feathers and, again, takes time to prepare. It also supposes that living off the land includes buying shotgun cartridges, as I’m fairly sure they don’t grow on trees. That’s one of the main points of the book, that foraging takes a lot of time and that it can be difficult to store things for later. It’s not just that we like different things (including bread and potatoes) these days, but that we are used to buying it from a shelf, ignoring seasonality and using a freezer. Another point that I take from the book is the advisability of heeding the warnings you get about eating some plants sparingly due to their oxalic acid levels. I don’t like the descriptions of illness and kidney pains he suffers, or to be accurate, the descriptions are OK, but I don’t like the prospect of oxalic acid poisoning. In the end, what is this book? It’s partly a gimmick, like taking a fridge round Ireland, and it’s partly a book on foraging, though you’d need to have a book on plant ID to supplement it. Mainly, for me, along with insights into family life, nature and the countryside, this is the story of a man who made up his mind to do something and stuck with his task through thick and thin. He didn’t win a major sporting prize, row the Atlantic or cross the polar ice but he does exhibit the qualities you would need to do such things. It’s an excellent book containing the story of an exceptional year, and I thoroughly recommend it. It may not be perfect, but who is? It’s a cookery book, not a recipe book, as Fowler is keen to tell us several times. It’s also a book for men, and men of a distinctly unreconstructed sort. For killing, hanging, preparing and cooking this book has no equal. If you are looking for fancy stuff like recipes you aren’t going to find them here. You’re not going to find much in the way of pastry here either because he has his own way of providing pie crust. I won’t tell you how he does it because it’s one of the highlights of the book, even though other reviews seem happy to spoil the punchline. There is a short section on vegetables at the end, sharing the final 14 pages with batter, shellfish and eggs. That’s about the right proportion according to my thoughts. Originally published in 1965, it’s definitely the product of a different age, as his women are treated like cooks and he assumes you have a firearm handy if you ever wanted to shoot your own sheep. Originally the book didn’t sell well and it was only when Ludlow based publisher David Burnett bought a copy of the book for 50p in an Oxfam shop that things took off. He tried the recipes out, found they were popular and decided to reprint the book. An initial print run of 1,000 sold out in a morning and he eventually shifted 10,000 – well over his estimate of 600 in three years. I was a little disappointed at the lack of cat recipe – he makes mention of eating the Camp Commandant’s cat with a black market onion whilst he was held as a prisoner of war but there are no further details. This mirrors my other experience of cat in wartime, muttered rumblings from my mother about never buying a rabbit in the war unless it still had the skin on. The two animals, it seems, are identical when skinned. I confess I haven’t tried the recipes yet, but you don’t have to, it’s well worth reading for the entertainment, or as a social history of an English gentleman, without getting involved in giblets and gizzards. Treat yourself. It cost me £2.81 from Amazon, what else provides such value? £8.99 though as you can see from the photograph I did get a bit of a deal from Waterstones. A good read, and an informative nature book – one of my favourite combinations. What could possibly be better (apart from the addition of some cake recipes)? Apart from those minor points I have no quibbles. It’s a fine example of how I like these these books to be – a tour through time and an examination of the present fitting together to set everything in context. There is a lot of wildlife on his farm, but he’s realistic enough in tone to know that he’s lucky, and that there’s not as much wildlife as there used to be. It’s also an example of what you can see if you develop the habit of observation. I used to be observant as a child, but I seem to have lost the knack as I grew older. Maybe I’m entering my second childhood now, as I’m starting to see more, but maybe it’s just that I have more time to stand and watch as I grow older. This is a well-written book, covering gardening, history and urban regeneration as well as guerilla gardening, and I’d be happy to read it just for entertainment. I was even happier on reading it to find that he cites Winstanley and the Diggers as the first guerilla gardeners, as they’ve always been one of my favourite episodes in English history. 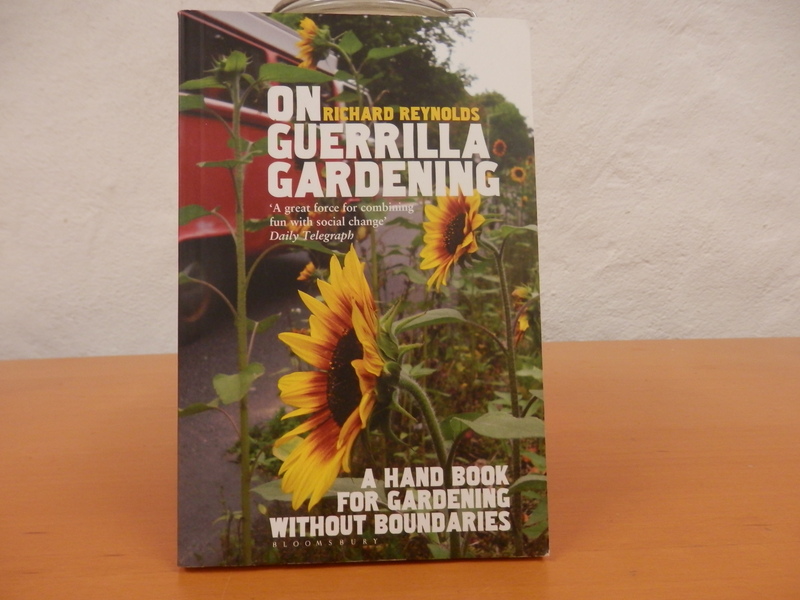 However, if you’ve bought it because you want a guide to guerilla gardening, you’ve made a good choice too. It’s full of practical advice – legal, PR and recruiting, as well as selecting sites, sourcing plants and gardening – and if I ever want to start up I’ll have all the information I need. I’ll also be able to draw inspiration from the stories of other people and their varied projects. Price? Well 12 years ago it was £7.99 but I bought it last year for £1.49 from Oxfam. I’m mainly a reader of crime fiction which means that I expect to be kept waiting until the final few pages before I know the outcome. That obviously wasn’t going to happen in this case as we all know what happened to the Eden Project so right from the start I had no feeling of tension. Maybe I should have done, because it wasn’t all plain sailing in the initial stages, but that was somehow wiped away by the style of writing. Even when there was a problem they always managed to sort it, often by using one of their huge number of volunteers, who all seemed to be larger than life and always came through. I’ve worked for several sports clubs and projects and have yet to finds either a surplus of volunteers or an answer to every problem. Whilst reading how everything fell into place I was reminded of a quote from Henry Labouchere I heard around forty years ago in a history lesson. I don’t object to Gladstone always having the ace of trumps up his sleeve, but merely to his belief that the Almighty put it there. That about sums it up for me. 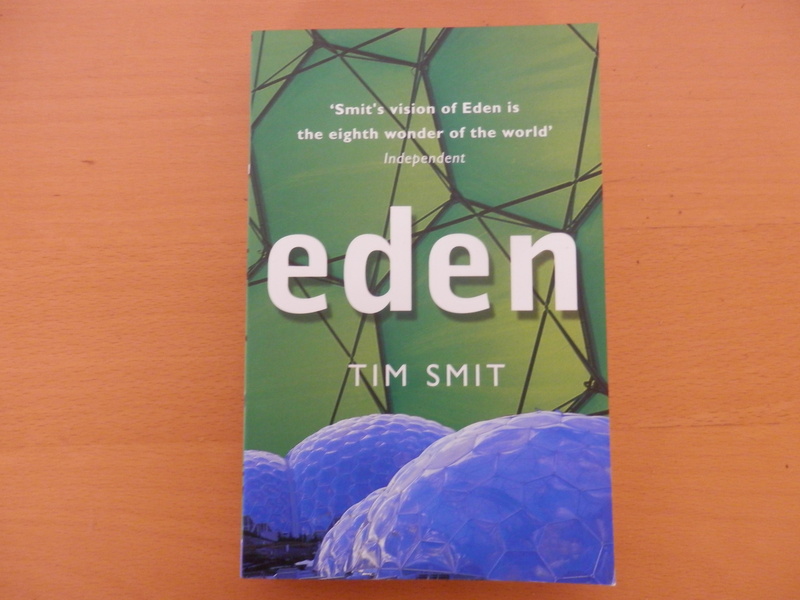 I don’t mind Tim Smit winning a prize for his book on Helligan, or having all these brilliant volunteers, or winning millions in funding: I just mind him making it seem so easy. Well, to be honest, maybe I do mind just a little bit. Leaving those personal feelings to one side, it’s a decent enough book to pass a few evenings, the writing style is relaxing and it has some very interesting information on how big grant applications work, what has to be put in place to make them work and the sorts of problems that can arise. It also shows the fundamental goodness of people in making a project work when things are going wrong, because at the time they didn’t have the benefit of the hindsight that I was able to use. By the end I was happy they succeeded and impressed by what they had done, though I would have liked more information on running the centre and buildings and about the plants and plant hunters. It’s frustrating, reading an overview, or just a single fact, and wanting to know more about the nuts and bolts of how it all works. I suppose his grasp of the big picture is why he now has a knighthood and my fascination with the small things is why I have a mop. So, to sum up – an interesting read that left me slightly better informed than when I started. I’d be happy to recommend it to anyone as a good read, though maybe a frustrating one that lacks detail. The worst bit isn’t the content but the style. It’s well written and easy to read but it does verge on being smug. Still nobody is perfect. As I think of his huge grant, his knighthood and his writing prize maybe this review verges a little on jealousy. We all have our quirks!